luscious island paradise might seem suitable for a relaxing holiday, but it also makes an ideal venue for off-road racing. The follow-up to MotorStorm trades the desert for golden beaches and verdant jungles that are as dangerous as they are beautiful. 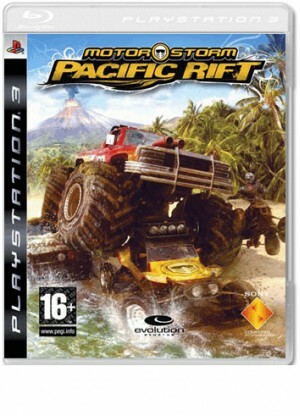 The basic setup of Motor Storm - Pacific Rift is familiar: 16 different drivers behind the wheel of vehicles ranging from monster trucks to speedy motorbikes. Race courses are only loosely laid out, and its completely up to you to pick the best route for your vehicle. Take the easy route, and you risk getting shunted off a cliff by your rivals. Or you could risk everything on a more dangerous shortcut. Some may be disappointed that this isnt much more than a change of scenery from the first game, but when it looks this good, thats not much of a problem.